This special collection of Shaker greeting cards makes a nice gift for anyone who has a fondness for the village and also enjoys Shaker recipes. Set includes 2 each of 4 designs, 8 cards total. 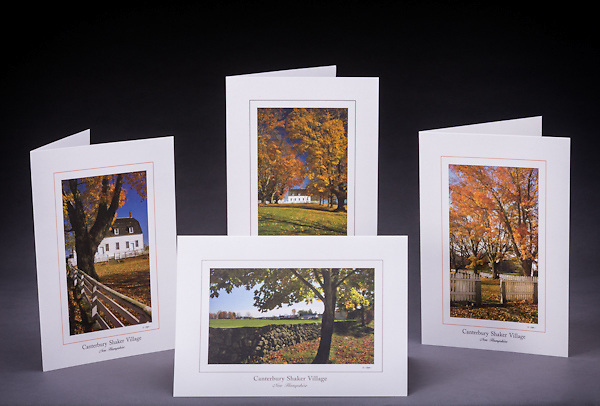 Artemis Photo Greeting Cards featuring NH native flora and fauna and historic sites. The cards are made exclusively in NH made from 100% FSC recycled paper, manufactured with wind and water power, and are archival acid free paper. Each card includes details on the back about the image, including interesting anecdotes, historic facts, conservation status, and recipes. May not be copied, transferred, or used without prior written permission from Kathie Fife Photography.